Halloween | KC & Co.
Halloween—a time for scary ghost stories,horror movies, and haunted houses. That’s enough to put fear into the hearts of many people. But for parents of T1DM’s the scariest part of Halloween is not the tricks but the treats. How can we keep our T1 on an even keel with all that candy around? Some parents choose to avoid trick or treating. Some give out toys or stickers instead of candy. My goal as KC’s mom is to give her as normal of a life as possible. And this year, that meant letting her trick or treat with her friends. We prepared for the night by bolusing her dinner on the high side to keep her numbers lower. It was also a site change day (as are Thanksgiving and Christmas as she pointed out to me–she has them marked on her calendar) which meant that her CGM would need to be calibrated during the trick or treating. I was so proud that she managed to calibrate by the light of her friend’s cell phone and then kept on going. Her CGM alerted her that she was running low, so she popped a candy or two along the way. By the time she was done, her BG was 100! All the walking also helped maintain the lower BG. Anyway, she felt like a normal kid! So what to do with the candy afterwards? First, as always, KC divided up her candy–giving her milk allergic brother all the dairy-free candy (which meant she got to keep all the chocolate!). She took two mini tootsie rolls to add to her lunch at school today. After school, we wrote the carb count on each candy bar, lollipop, and bag of M&Ms and then placed them in a storage container to be used for special snacks and to treat lows. Lucky for her (at least to her way of thinking) she dropped to 45 tonight and had to eat a fun size Milky Way and mini Kit Kat+ a bag of M&M’s to bring her sugar back up. Glad we didn’t get rid of the candy! 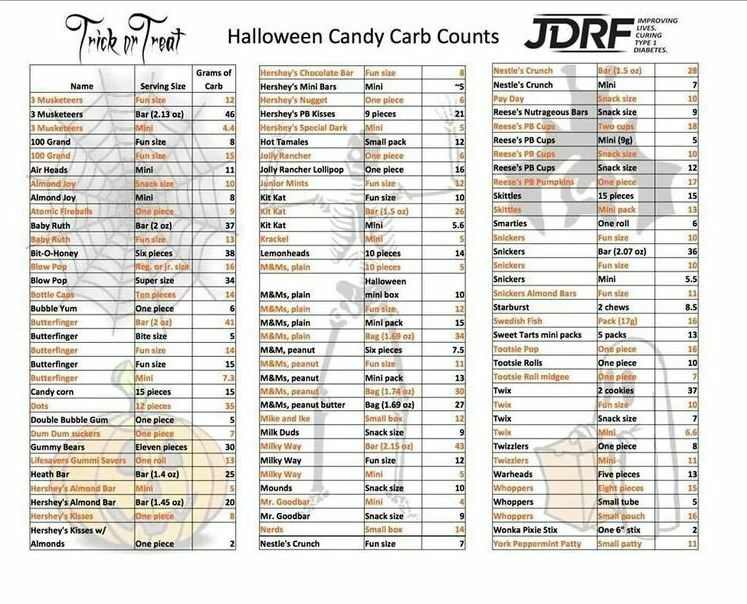 Here is a carb chart for the most common Halloween candies that I used to help label her candy. What a wonderful tool! Posted in Halloween, type 1 diabetes and tagged candy, Halloween. Bookmark the permalink.